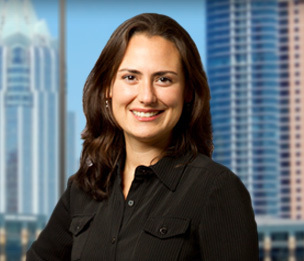 Erin Dempsey's practice focuses on finance and real estate law. Ms. Dempsey has experience representing both borrowers and lenders in a broad range of debt and equity financings including construction, permanent and mezzanine financing involving hotels, office, warehouse, storage facilities, multifamily and shopping centers and represents lenders and borrowers in warehouse lines of credit. Ms. Dempsey has experience representing landlords and tenants in various commercial leasing matters on all property types on a local and national basis and has experience representing parties in private equity transactions including the acquisition of distressed debt portfolios secured by commercial real estate and the subsequent asset management activities. In addition, Ms. Dempsey has experience in representing borrowers in connection with loans to be securitized and loan servicers in connection with the loan servicing of securitized loans. Represented private equity group in the acquisition in the acquisition of commercial loan portfolios secured by real estate throughout the U.S. Represented private equity entity in obtaining $70 million revolving warehouse line of credit in a structured finance transaction secured by commercial loans and real estate throughout the U.S. Represented major electronics chain in office and warehouse leasing throughout the U.S.
"Distressed Debt Acquisitions and Subsequent Workouts"